UPDATE: The 700w has been officially announced, though Palm hasn't technically used the 700w name yet. Our friends at Engadget got ahold of the next generation Treo (what we've been calling the Treo 670). Turns out the name is the Treo 700w and it's running Windows Mobile. Palm is expected to have a PalmOS version too, which means it will likely be called the Treo 700p. Engadget's unit has a Verizon Wireless logo on it just like some past spy shots. The Treo 700 series will likely be officially announced very soon. There is a Palm analyst meeting on the 26th (next Monday) that could be a launch venue. 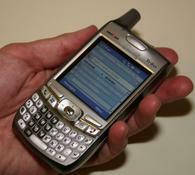 On a related note, Palm was sued the other day for bugs in the Treo line.